Instead of relying entirely on prescription medicine to solve medical problems, healthcare providers at a free clinic in Wheeling, W.Va., are prescribing healthy, fresh foods to a pilot group of patients. 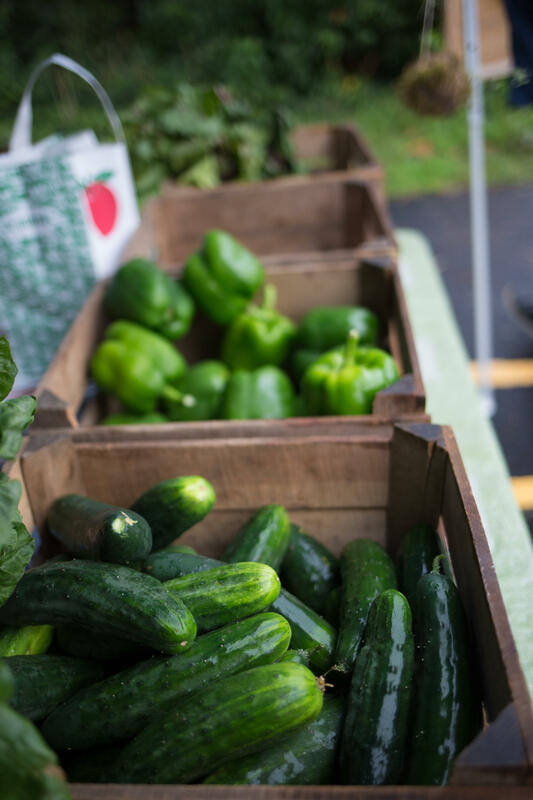 It’s a grant-funded initiative called Farmacy, offered through the clinic, Health Right Wheeling, and a food advocacy organization, Grow Ohio Valley. The Farmacy is the brainchild of Carol Greco, D.O., and physician assistant Amanda Cummins. Last year they were running a diabetes support group when they realized that many of the group members didn’t eat fresh vegetables, period. Doctor Carol Greco (left) and her daughter check in patients at the Health Right Farmacy in Wheeling. Cummins and Greco shifted to teaching basic cooking skills for a couple of weeks. This helped. But Greco and Cummins felt they needed to take the project one step further. In collaboration with Grow Ohio Valley, Health Right Wheeling procured a grant to start the Farmacy. The grant gave them enough money to give prescriptions of produce to 35 people for 15 weeks. Vegetables at the Health Right Wheeling "farmacy." 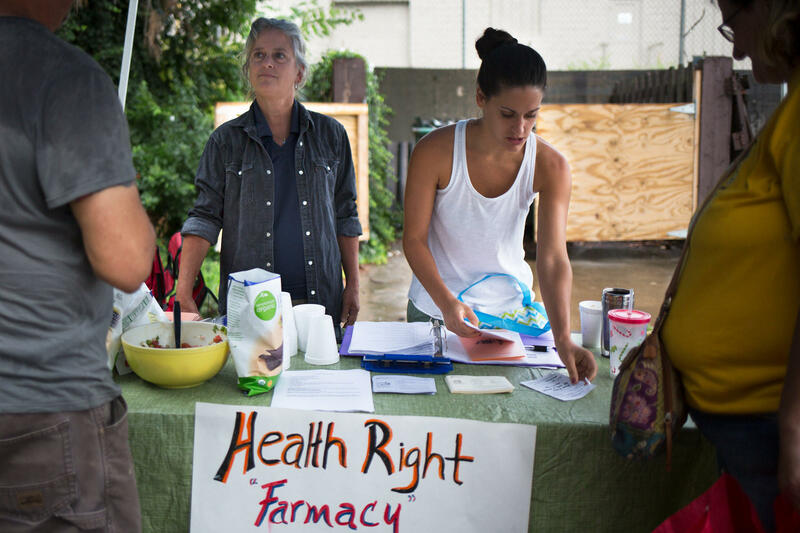 At the Farmacy, after Greco fills out a prescription card for “20 dollars of fresh vegetables,” she’ll gesture to the tent beside her where Kate Marshall of Grow Ohio Valley is helping a patient pick out onions, potatoes, micro greens, tomatoes and various fruits. In the first two weeks, 98 percent of participants turned out to get their vegetables, said Greco. The third week about three quarters of participants showed up, a drop that Marshall attributes to the heavy rain through which most participants had to walk get to the clinic. Over the next 12 weeks Greco and Cummins will be monitoring participants such as Brenda and Brooke Mazza to see if their health problems diminish with their access to healthy food. Appalachia Health News will also be following the Mazzas over the next 12 weeks to see what impact fresh food has on their lives. Appalachia Health News is a project of West Virginia Public Broadcasting, with support from the Benedum Foundation. A local-food nonprofit based in the Northern Panhandle is busy this week reclaiming abandoned property. On West Virginia Morning, Glynis Board reports from Wheeling about what’s called a “food justice immersion program” to show college students what it’s like to try to put food on the table in a food desert. And from Pennsylvania, a report about how researchers are building a better honeybee. These stories on West Virginia Morning from West Virginia Public Broadcasting – telling West Virginia’s story. A group of students from the University of Notre Dame just came to West Virginia for fall break. Instead of relaxing with friends, as many college students do, these guys got a taste of life in a food desert. This week half a dozen Catholic nuns arrived on a bus in Wheeling. The women are part of NETWORK, a National Catholic Social Justice Lobby, which educates, organizes, and lobbies for economic and social transformation. The Catholic Sisters visited shelters, schools, food pantries, and citizens, in Missouri, Kansas, Arkansas, Tennessee, Indiana, Ohio, and finally, West Virginia as they made their way to Washington DC. The tour is in response to Pope Francis’s call to transform politics and the economy. It’s been more than 50 years since President Lyndon B. Johnson declared the War on Poverty. During the 1960s, the Appalachian region was facing economic hardships, partly because of mechanization in the coal fields. In 1965, President Johnson signed the Appalachian Regional Development Act of 1965, which created the Appalachian Regional Commission.